Burwain Sailing Club wins Sunsail award for developing junior and youth sailing. 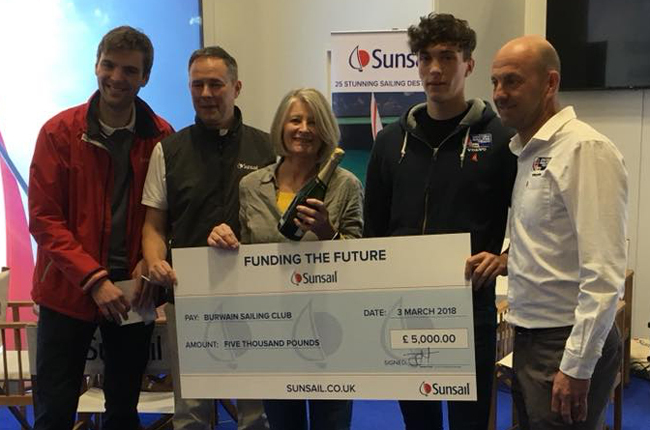 Against stiff competition from other clubs, Burwain has landed top prize in a national Sunsail competition for clubs looking to develop their junior & Youth activities. The bid was carefully prepared by Committee members Peter Norcliffe and Peter Dewhurst and the reward was kindly received at the RYA boat show by the Club’s Child Protection officer Catherine Dobson. The funding will help the Club purchase safe small sailing dinghies for children aged 6-10, creating opportunities for children to have fun whilst learning to sail. Sunsail and the RYA were impressed by Burwain’s proposal to encourage family sailing. For those interested, here is the proposal that made the difference to the judges. “Burwain is a forward looking sailing club in Lancashire, on the edge of the former mill towns Colne and Burnley. We sail on a 90 acre reservoir which feeds the Leeds & Liverpool canal. Against all the odds (it’s all football, crown green bowling and pigeon racing here) we have reinvented ourselves from being a rather elitist club of mill owners and carpet baggers to a genuine sailing oasis with a wide appeal to all sections of the community. We are an RYA Training Centre , run by enthusiastic volunteers , but one of our greatest successes was to develop a young person’s club (The Sailfish Club) which has introduced over two hundred youngsters to sailing over the past 8 years. Many of these have gone on to become instructors and one is part of the Olympic 49er squad. We are constantly looking to expand our club fleet and have sufficient boats for older juniors and youths but now want to encourage even younger children (6 to 8 year olds) and get them into non-threatening boats, which Toppers aren’t when you are 6 years old. At our last NW Juniors Open Event we were visited by a fleet of Optimists from West Kirby. They were an inspiration and convinced us of how a similar fleet at our club would encourage younger children to take up the sport. We have the experience, infrastructure and training skills to attract this new audience, as our track record proves. All we need are suitable boats, and good pre-used Oppies can be acquired for around £1000. to £1200. Starting next Spring, 4 or 5 second hand Oppies would mean we could train approximately 20 new young sailors in 2018 and many more in the future. Young sailors bring parents, and our second area of focus for the coming year is attracting families. We have some well sorted RS Visions with cut down mains, so we’re ready for them. A recruitment double whammy! Our catchment area means that we attract children from all social backgrounds. East Lancashire has a large Muslim Asian population and we have had some success in reaching out to these and other minorities although cultural attitudes mean we have challenges to overcome, we are up to the task. Additionally, in association with a local school, we are set to start an RYA Sailability training program early 2018. We have aquired three boats and are looking forward to getting them on the water in April.